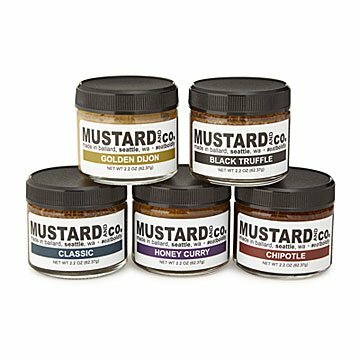 This set of five mustards will kick up the flavor of sandwiches, salads, and recipes. Survey the wonderful world of mustard without a long list of unnecessary (and unpronounceable) ingredients. This set features five bold varieties--classic, garlic dill, black truffle, smokey BBQ, and honey curry--that will kick up the flavor of sandwiches, salads, and recipes. The sampler includes five tempting recipes, each featuring one of the mustards to showcase the array of flavors. Hand-crafted in small batches by Bryan Mitchiner and Justin Hoffman in Seattle. Click here for recipe ideas using your Flavored Mustard Sampler. Hear from Justin and Bryan about how they took mustard matters into their own hands in a Q&A on the blog. The scene: small town Wisconsin. Our hero, Justin Hoffman finds himself staring at the lengthy list of ingredients on a bottle of fancy shmancy honey mustard. Perplexed at why a seemingly simple spread would be so replete with additives, he runs home, zips through a montage of research, and whips up his first batch of custom mustard. Over the next few years, Justin takes to making mustard as a hobby, testing it out on friends and family until he sets out for Seattle. Enter Bryan. Fresh out of college and intrigued by Justin's mustard-making talents, Bryan suggests turning Justin's hobby into a small business. With support from Molly's—a restaurant that offered them after-hours kitchen space—Justin and Bryan's mustard business was born and continues to make its mark on the world of small-batch condiments. Hear from Justin and Bryan about how they took mustard-matters into their own hands in a Q&A on the blog. Separation is natural. Shake well & refrigerate after opening. I did buy this product and difinately buy again. Gave this as a gift to my father-in-law, who loves mustards - he adored the gift! This was an awesome part of my "grill themed" gift for my dad. The mustards are so good! It's a nice way to try them, but I had to have more of the honey curry so I sought out the company and ordered a big one!! Would be nice if the full size jars were offered as well. Great variety of flavors. Small grain traditional mustards. All of them are great on sandwiches, BBQ flavor is a nice addition to hot dogs and sausage. There was a good amount of each, even for a sample package.